Free Seminar held at Manchester Firing line, featuring experienced attorneys, law enforcement, and other firearms professionals who cover a wide-range of topics such as the Castle Doctrine, the justified use of deadly force, where you can legally carry, what to expect when law enforcement arrives, and much more. Every event has dedicated question-and-answer segments to ensure all attendees are able to get the information they want to know from a credible source they can trust. Click here to register. 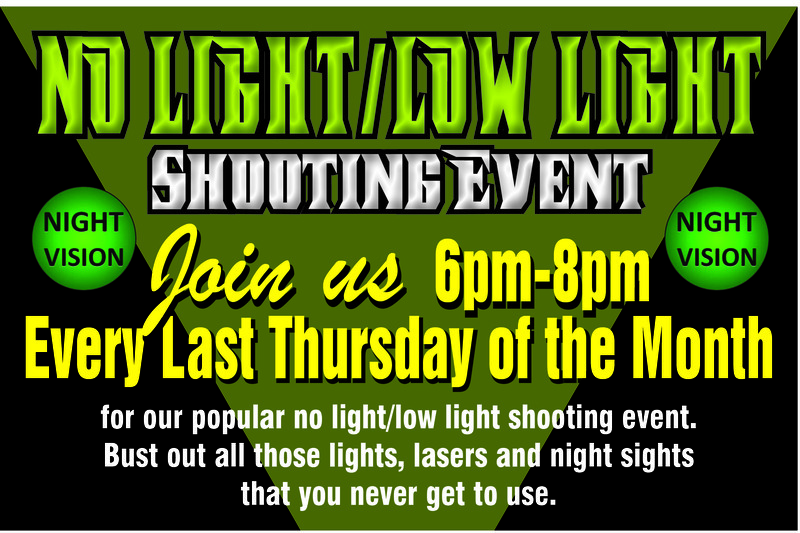 Join us on the LAST Thursday of EVERY MONTH for our popular no light/low light shooTng event. Bust out all those lights, lasers and night sights that you never get to use. Don’t have all that fun tactical gear? No problem! Rent ours so you can test it out and see what you think of it before you buy it. INDOOR TRACER AMMO AVAILABLE IN LIMITED CALIBERS! This unique event is limited to 6 lanes and by prepaid reservation only. Reservations are available at 6pm or 7pm for one hour. ALL PARTICIPANTS WILL RECEIVE A LOW-LIGHT TACTICAL DEVICE UPON ARRIVAL.